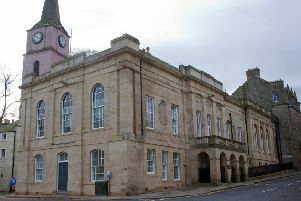 A 36-year-old man appeared from custody at Selkirk Sheriff Court and admitted a charge of behaving in a threatening or abusive manner in Gala Park Place, Galashiels, on Sunday. James Matthew Calder - formerly of Galashiels and now living in Hawick - pleaded guilty to shouting and swearing and making abusive and threatening remarks as well as slamming a door. Procurator fiscal Graham Fraser said Calder had been having an argument around 1.30p.m. with his partner about his daughter which was heard by neighbours and also witnessed by passing police officers. As an alternative to a fine, he ordered Calder carry out 50 hours’ unpaid work over the next six months.